Anna Wu became the new associate vice chancellor for facilities services at UNC-Chapel Hill, effective Oct. 1, 2015. Wu previously served as the University architect and assistant vice chancellor for facilities operations, planning and design since 2012. In that role she directed a team responsible for the planning, design, maintenance and operations of the University’s academic buildings, research facilities, residence halls, grounds and landscapes. 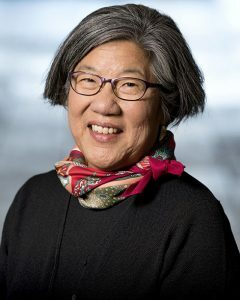 Wu has worked at UNC since 1995, when she was first hired as a facilities architect with facilities planning. Former Associate Vice Chancellor for Facilities Services Bruce Runberg then hired her in 2001 as the University architect and director of facilities planning, a role in which she led a professional staff of architects, engineers, landscape architects and planners, responsible for the planning and design project management for the UNC campus. Together, they executed the University’s $2.3 billion capital program. Wu received the C. Knox Massey Distinguished Service Award from UNC in recognition of her service to the University. In 2009, she was elected to the College of Fellows of The American Institute of Architects. She received her Masters of Architecture degree from Harvard University and her Bachelor of Arts degree from the University of Pennsylvania.